An adult liver fluke has an oval, flat body with a cephalic cone that contains the powerful oral suckers it uses to cling to and feeding off of the lining of bile ducts. 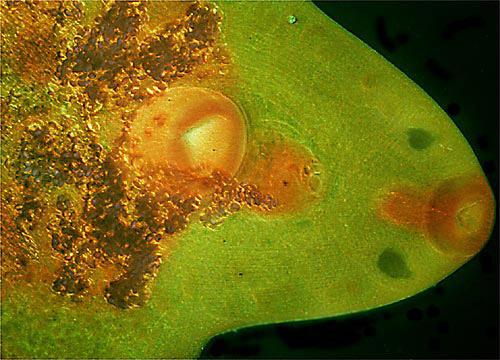 In addition to producing inflammation, these parasites may release a substance that stimulates collagen production causing fibrosis in the host's tissue; such a condition may proceed to atrophy the liver and lead eventually to cirrhosis. Symptoms of worm infestation can include anaemia, severe weight loss, and low milk yields in a host sheep or cow, possibly leading to its death.